The Naval Staff has issued an Operational -Tactical Requirement (OTR) for a light aircraft carrier. The OTR has been sent to the Naval Constructors Board and the Scientific-Technical Research Committee. A pre-design sketch by a Project Design Team has been evaluated by the Naval Constructors Board and Scientific-Technical Research Committee. A Technical-Tactical Requirement (TTR) has now been released to external companies. The home-grown design is the Project 702 (marked Top Secret and not available to view). An export design is to be designated Project 703. Size: preferably no longer than 170m but up to 200m considered. 170m perferred for home construction. Armour: Light but able to resist destroyer fire, belt and deck (hangar floor) armour required and torpedo protection if possible. If all designs prove unaccpetable a new Technical - Tactical Requirement will be issued. Australia offers the following design based on HMAS Enterprise. Two designs, losely based on Japan's Chitose design. One faster and one slightly slower design. The design meets or exceeds all specifications. In order to meet the preferences of the client, a relatively low L:B ratio and high BC was chosen, allowing for a somewhat roomier hanger. Gun battery includes 4 turrets fore/aft of the island. An additional 8 deck mounts are mounted at the corners of the flight deck, like the OTL Yorktowns. The 20mm and 37mm mount alternate along the edge of the flight deck. High freeboard is to represent an enclosed Hanger. This choice was made due to potential operations in the extreme south, including the straits of Magellen. 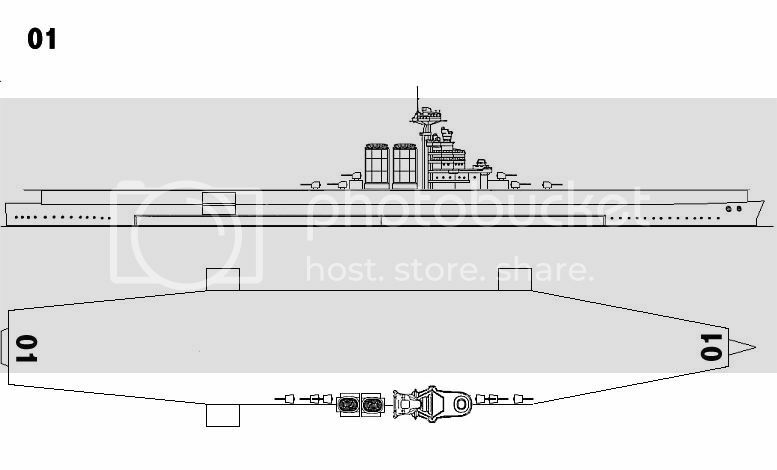 It is anticipated the main armor belt extends 1m above the waterline to the armor deck, above which is a full 2.44m deck, and then the 5.5m hanger. The 3.66m aft overhang represents the aft round-down, giving a 175m / 574 ft. flight deck. Two large centerline lifts are provided. An extra 100 misc weight represents additional ventilation and fire fighting equipment. 100 tons misc is "spare" for domestic equipment. . Observation : SQRT(1600) = 40. The design has plenty of excess comp hull and misc weight. Question- I count 32 (?) below decks, and no room to maneuver them, service them, etc. Basically the 6 near the one elevator*must* be the first moved on deck, and you have to have a deck park just to carry your max capacity. Carry 40, sure. But with that 2/3s length hanger, operate 40? Perhaps in wartime, but in peace, in the early 30s, do you want your 20%+ of your aircraft exposed to the elements 24/7 ? Improved Australian designs, one with 150mm guns the other one a full length flight deck one based on same hull. Wes, top and side view not fit on your drawing (see deck edge platforms for example)....?! Its a rough representation, based on the CVT Nautica. Deadline for submisisons is 12:00pm GMT Friday 2nd March. Not bad so far but could a couple more 170m designs be submitted as these would meet the specification more closely. Any ships over that will have to be built abroad, and none could be built in a home yard for some time. Politics is not a factor in selection. 557ft version, has extra strength for further improvements. Ansaldo - Italia feels that 170m is too short a hull length to be of sufficient use as an aircraft carrier and will not be resubmitting a tender. The Atlantean BuShips also feels that 170m is too short for sufficient CV design, however it can submit the following design. Walter, I'd sure love to see that carriers drawing, seems rather cramped. No Oyama Works designs at this time. Chile will not enter this contest due to the only designs on Chilean drawing boards are much longer than 170 meters, and our existing carrier is of Atlantean design. Also we wouldn't want to loose an edge however small it actually is now would we. What the heck; call this a private sector entry from Naval Defence Solutions Inc.
All weapons are mounted on the sides, while exhaust is trunked aft and discharged downward, similar to the historical Kaga. Together, this allows for a small island and an otherwise unobstructed flight deck, an important consideration given the relative restricted size of the deck. Lighter weapons are simmed as enclosed mountings, to protect crews from exhaust gases and weather. HDW of Germany submits the following entry, based on the new Otto Lillienthal class training carrier that is under construction. Space for 32 aircraft, along with 4 spares at 25 tons each. 120 tons reserved for command spaces and growth.